Have you ever tried playing around and bouncing off a trampoline? Sounds like fun, yes, but did you know that jumping around on an exercise trampoline can also help keep you healthy? Exercise trampoline is popular nowadays as it provides a simple and stress-free form of physical activity. It’s hard to select a trampoline that fits your needs with so many choices out there, so we’ve created these exercise trampoline reviews to help you out. How To Shop For Great Trampolines? 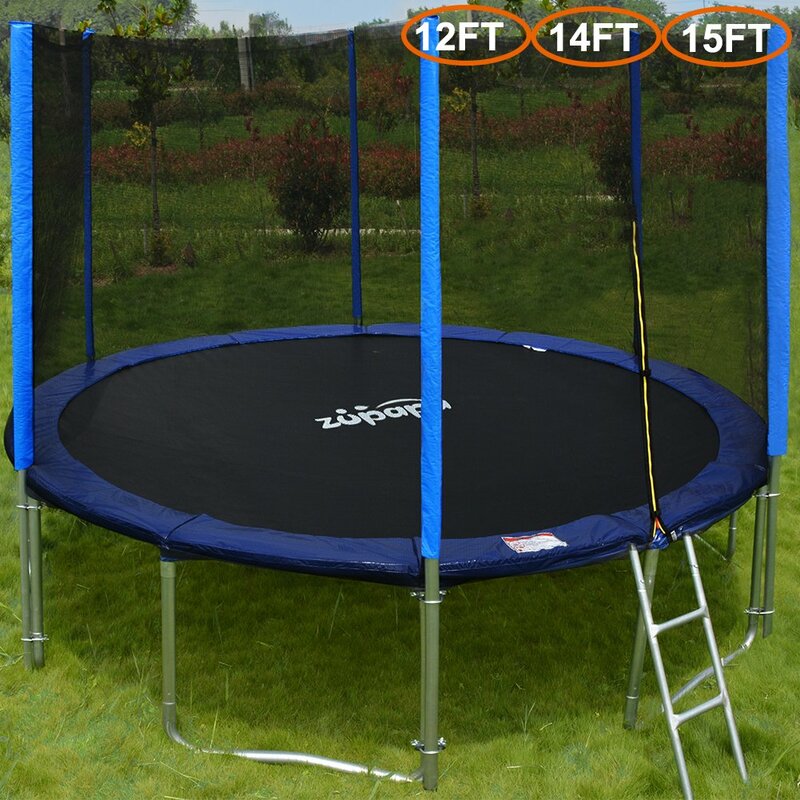 Zupapa Trampoline with Enclosure Net is a heavy-duty trampoline equipped with a small ladder, a net enclosure, and rust-resistant 7-inch springs. You’ll get a good, secured and effective bounce with this trampoline. Your family will enjoy this product because it can accommodate multiple jumpers simultaneously – up to 330lbs at least. However, its net is prone to tearing up, especially if you use it frequently. If you want to bring your jumping routine outdoors, then the Skywalker 12-Feet Round Trampoline is what you may consider. It features a galvanized steel frame and enclosure net, and is made from UV-resistant materials. This product is considered a safe and secured trampoline that’s great for kids and adults alike. However, since it’s lightweight, you may want to add a couple of anchors to its frame legs to improve its stability. 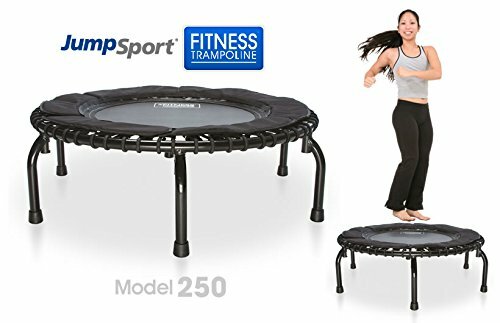 JumpSport Fitness Trampoline Model 250 is a 39-inch trampoline with a stable frame and 30 durable cords. This trampoline gets you moving within a few minutes out-of-the-box because of its easy-to-assemble nature. 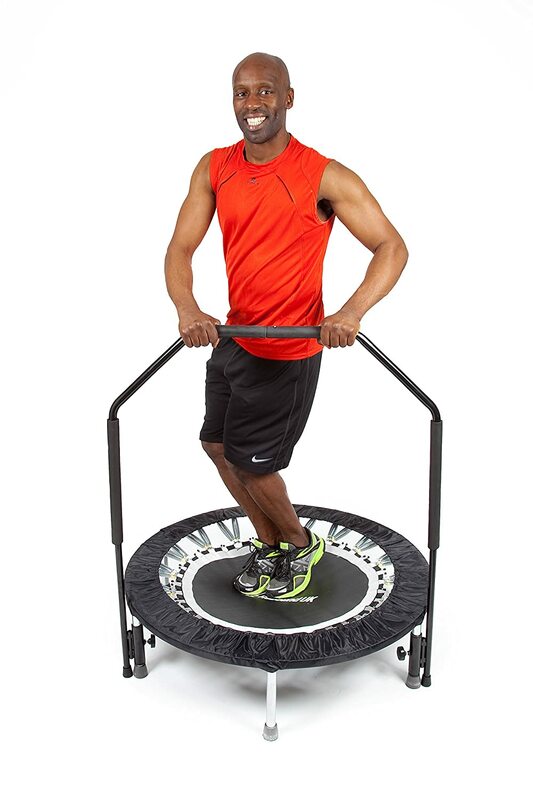 The JumpSport 250 is a good choice if you’re into professional trampoline exercises. However, this product isn’t primarily intended for recreational jumping. 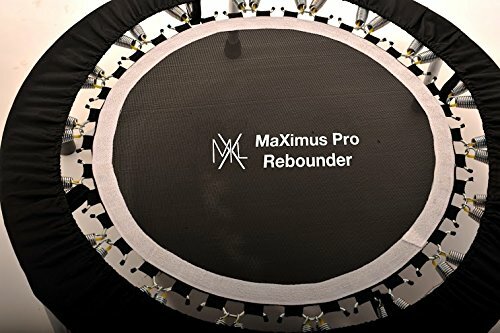 MaXimus Life Pro Gym Rebounder is a springy yet firm trampoline that delivers low-impact bounce. It’s has four foldable legs, making it easier for you to assemble and store it. This trampoline can safely be used by person weighing up to 130 kilograms. Frequent use of the product, however, exposes it to faster wear and tear. If you’re looking for a compact trampoline, try the Stamina 36-Inch Folding Trampoline. It’s a 36-diameter foldable equipment with detachable parts for easy storage. This product is great to keep your family engaged in jumping and rebounding. However, since this trampoline is a bit smaller, it can accommodate one jumper at a time only. Check out this trampoline from Zupapa if you need one with safety features and if you’re planning to let kids use this trampoline. The Zupapa trampoline comes in 12, 14, and 15 feet variations. All of them have essentially the same features. The trampoline frame and net enclosure frames are all made of steel. You can prevent structural twisting because it has steel joints that connect the main frame to the enclosure frames. The trampoline comes with more than a hundred galvanized springs to ensure high bounces with low impact to your legs and knees. The large black jumping mat is firm yet soft and feet-friendly. A small ladder is included so you can safely climb the trampoline with less stress on your legs. A zippered net enclosure is also available for additional safety. The entire product is made of UV-resistant materials, making it suitable for outdoor conditions. It also has a rain cover to protect you from sudden downpours. The trampolines are created under strict German quality procedures. Hence, they all bear the TUV certification – a safety certification from Germany. Looking for a trampoline with many safety features? Then you might want to check out this trampoline from Skywalker. The Skywalker 12-Feet Round trampoline is made of heavy galvanized steel frame. It features six W-shaped steel legs, an arched enclosure frame, and a safety net. The unique W-shaped steel legs provide stability during jumping sessions. They need no more additional anchors to keep the trampoline in place. A large black jumping mat is available, securely attached to both the main trampoline frame and the enclosure net frame. The mat is made of sturdy materials and can handle up to 200lbs of weight. This trampoline has an enclosure net fitted to the trampoline frame through T-sockets. The enclosure net keeps the jumpers confined within the jumping area and prevents injuries while jumping. Jumping outdoors is easy because this trampoline is created with UV-resistant materials. This ensures that the trampoline can withstand sunlight, heat and humidity. Since this is a device with lots of parts to set up, proper assembly may take up to 3-4 hours. Beginners will find the instruction manual useful to help them fit the pieces correctly. 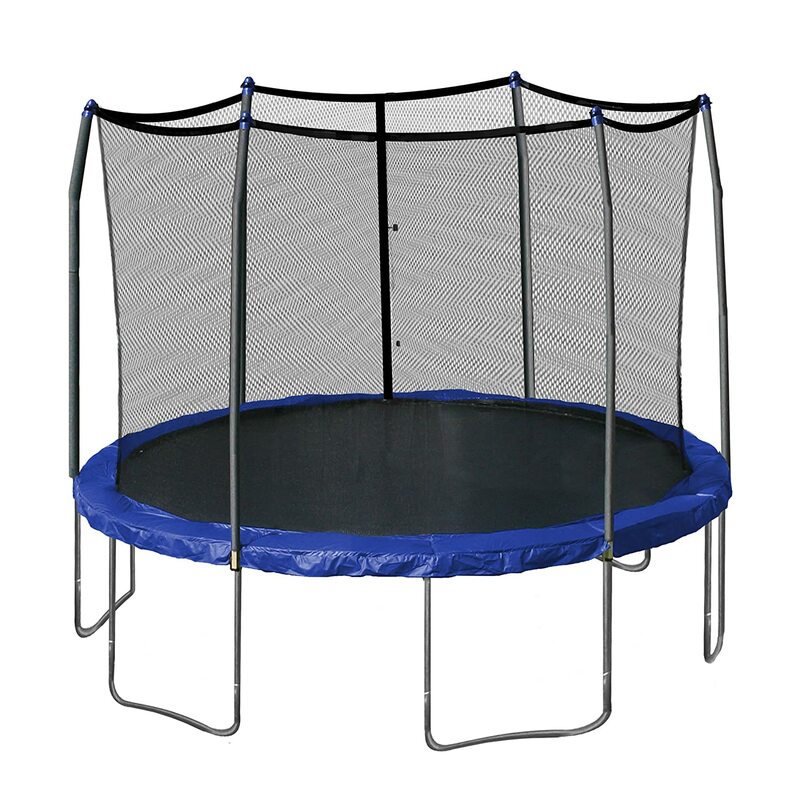 The JumpSport 250 is a sturdy trampoline made of rust-resistant arched legs, 30 durable cords and a solid frame. Its padded rebound surface remains firm and delivers a low-impact bounce. The arch of the trampoline’s steel legs provides a steady and sturdy base. The legs also help evenly dissipate the force of a bounce, so that the trampoline remains stable even during repeated use. The trampoline has a 39-inch diameter platform. Its mat features a petal design to release tension and increase its durability. One good feature of this JumpSport trampoline is its quietness. Not all trampolines work quietly during a bouncing session but this one is quiet enough to enable you to watch TV while bouncing off. Assembling the equipment is fairly easy. Just unfold the trampoline’s legs so you can start using it. An instruction manual is included with each product purchase. An instructional DVD also comes with each trampoline purchase. The DVD contains exercises and motivational tips to let you stay fit while jumping on this trampoline. Though it has a 39-inch platform, the jump area is small and can be used mostly for exercises only. It’ll be hard to do recreational jumping on this trampoline. This equipment is actually developed for fitness programs and professional use. Hence, its robust design makes it easy to use for various rebounding and cardiovascular exercises. 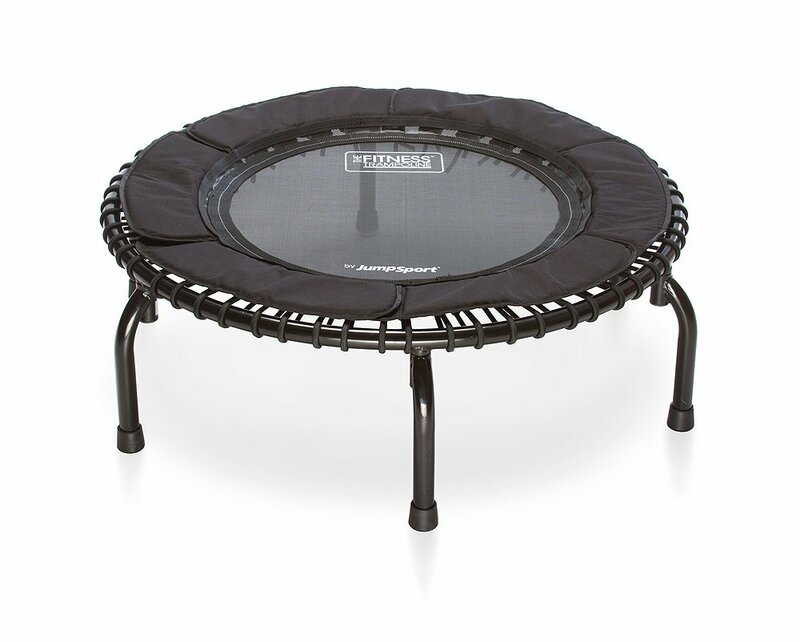 If you want a simple trampoline with durable features, you may try the MaXimus Life Rebounder. This mini-trampoline packs a powerful punch in design, strength, and effectiveness. The MaXimus trampoline comes with a solid built and an easy assembly system. It has steel frames with a diameter of 102 centimeters. The trampoline has a minimalist, sleek, black design. It is compact and you can easily fold and store it. The trampoline features a large spring system to create a low-impact bounce. Its legs are spring-loaded, and are sturdy enough to provide support even during repetitive use. 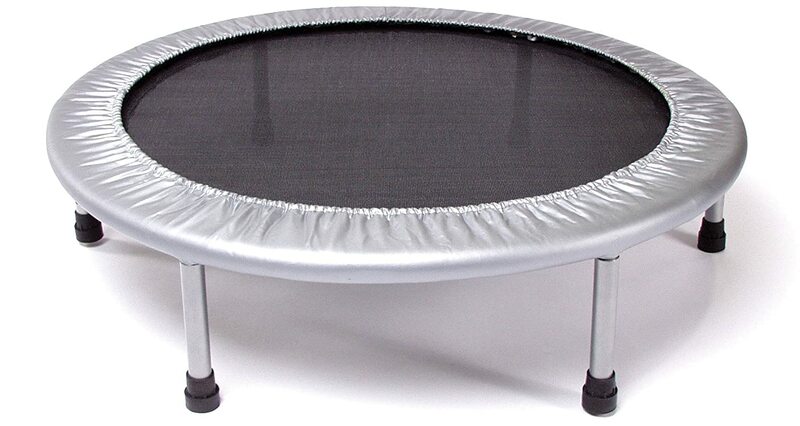 A capacity of 130lbs makes this trampoline a good choice for individual exercisers. The mat is made of high-grade materials, and is strong enough to provide firm support for its users. It may not be the quietest trampolines, but it provides ample silence even in use. You can use it at night without distracting your family or downstairs neighbors. Use this trampoline slowly because first-time trampoline exercisers may find it a little tough. You can utilize the exercise DVD that comes with the equipment. It shows various exercises that you can do with it. The unit may be a bit expensive, but the price tag is worth its features and durability. Try this trampoline if you’re aiming to get fit at home, without going to the gym. Consider purchasing this trampoline if you’re a traveler who often goes to several places, or if you have a small living space and need something compact. Stamina’s folding trampoline will get you exercising quickly and safely anywhere you are. The trampoline is made from an all-steel frame with rubber-tipped legs. It has 30 bands for tension resistance, and a large black rebounding surface. This device features a 36-inch diameter for a wide jump area. Kids and adults alike can safely jump around on this trampoline. It has a safety pad and a strong polypropylene jumping surface. This enables the device to stay firm while delivering low-impact bounces. It also has six rubber-tipped legs that provide ample stability and create no scratches on floorings. These legs are also detachable for easy storage when not in use. An interesting feature of Stamina’s trampoline is its folding ability. You can fold down the device into smaller components – this is good for compact storage and travelling purposes. Once folded down, the entire unit can fit into a duffle bag or can be slid in small spaces inside a room. The product is generally safe for individual use. However, there are no additional safety features like an enclosure net or bars, making it a bit unsuitable for children’s use. With the busy lifestyle that we have today, there’s virtually no time for gym memberships and exercises. That is why exercise trampolines are becoming popular nowadays. And who would have thought that simply jumping around can have positive effects on our health? Trampolines provide a low-impact exercise. They’re great for people suffering from joint pains and other high-impact exercise restrictions. Cardiovascular exercises can be done on trampolines. Jumping around is a great cardio exercise in its own way, but adding some more moves on the trampoline raises your heart rate even more. ​Trampolines are compact and handy. Instead of going to the gym to use various equipment, you can install the trampoline at home so you can do something to improve your fitness level anytime you wish. Trampolines are engaging. You can get your entire family and kids to jump around a couple of hours a day, and they won’t even notice they’re already exercising. Trampolines spell tons of fun! Bouncing around takes you back to childhood years and can bring out your inner kid-at-heart vibe. You’ll always want to purchase a reliable trampoline, one that’ll stick around for years and give you the benefits of trampoline exercises. So, here’s a round-up of what to look for in a trampoline. Good construction – Make sure that the trampoline has heavy-duty frames as these guarantee its stability and security. Evenly distributed feet – This is a must. The feet should be even so the trampoline doesn’t topple over during use. ​Sturdy, firm yet soft jumping mat – This is to keep your feet safe and help improve your balance. ​Springy trampolines – Make sure the trampoline is springy enough to enable low-impact bounces. Safety features- Enclosure nets, handle bars and ladders give the trampoline additional safety. They make trampolines suitable for children’s use, too. The winner in this best exercise trampoline reviews is the Zupapa Trampoline with Enclosure Net. The fact that it has plenty of safety features – the springy nature, firm jumping mat, sturdy frames and poles, zippered enclosure net, ladder, and rain cover – make it a great buy. Zupapa’s trampolines provide you a low-impact bounce that can truly ignite your cardio exercises. It can motivate you to exercise regularly because the activity is fun. The TUV certification from Germany proves that Zupapa’s trampoline is truly a good choice.